Emotionally sensitive people often have a difficult time with saying no. Some have difficulty saying it at all and others say it too often. Some say it timidly and others say it too harshly. Sometimes out of fear or discomfort people give lots of reasons for refusing a request or invitation or apologize for not being able to say yes though they really may not want to agree. Often the difficulty about saying no isn’t about knowing when to say it but about the interpretations that are put on the word or that they fear will be made. Sometimes people are afraid of the result of a refusal, even when their fears are not likely to occur. For those who don’t say no often enough, the reason may be about the meaning that they associate with the word. Saying no can be interpreted as a rejection or a lack of caring and emotionally sensitive people don’t want to hurt anyone’s feelings. Sometimes ‘no’ may be interpreted as abandonment of someone you care about, though that does not need to be the case. The word could also lead to someone abandoning you and the loss of a relationship that is important. When saying that two-letter word to someone you care about, you are likely to feel vulnerable and that can be uncomfortable. Sometimes it’s just too scary to do. Sometimes not saying ‘no’ is about maintaining an image, such as being superhuman-like and able to meet all needs and requests. Or being a kind and giving person. Some may try a weak no, one that is ineffective and can be countered or argued by the receiver. “I don’t want to intrude,” would be a weak no. The other person will most likely respond with something like “It’s no problem.” Or maybe you say, “I’m not much fun at events like that,” or “I don’t enjoy that kind of music.” Those are statements that leave an opening for someone to overrule you. To avoid saying no, some just say yes and grit their teeth. They do a lot of activities they don’t want to do, buy things they don’t want, split expenses they don’t want to incur and loan belongings they would prefer to keep in their possession. When you don’t say no to requests or invitations, then relationships become burdensome. Instead of feeling fun, supported and connected, you feel like relationships are work. You may dread being around people. 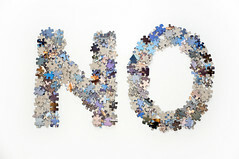 When you want to say no, keep in mind that your refusal is not about the other person. It is not a gauge of how much you care about someone. If you look at refusing to do something as endangering the relationship, you may send that message to the other person. Saying no is simply stating you prefer not to do something. It’s about you and your choices and preferences. Keep it simple. Many times long explanations send a message that you are uncomfortable with the word, which then makes the situation awkward. “No, that doesn’t work for me,” or “No, I can’t do that,” are simple and direct, especially when said in a gentle, easy manner. If you are struggling or aren’t sure of what you want to say, ask if you can get back with them later. Giving yourself some time will help you consider your response more carefully and not agree in an impulsive way. Maybe you have some fear about saying no. The best way to overcome a fear is to face it. The more you practice the easier it will be. Remember that saying no is respecting yourself and your goals and what helps you live a contented life. When you spend time doing activities you don’t want to do, you have lost that time and can’t get it back. In addition, you may lose some respect for yourself, knowing you didn’t stand up for your wants, values, or wishes. Tell your friends and family you are working on saying no and ask for their support. Sometimes family members and friends react more to the change in your style than to your saying no. They wonder why you are different and may create reasons for your new behavior that aren’t accurate. Explaining that you will be working on a new behavior and asking for their help may help them support you more effectively. Most likely you prefer people who are direct with you and don’t treat you as fragile. When you hesitate to say no or hedge, you are treating the other person as fragile and unable to cope with your answer. Saying no when you need to and want to is taking care of yourself. That’s important.